Colorful lights twinkled everywhere within this world of glaciers. The Ice Demon King was incredibly fast, in just three minutes it had caught up to Jiang Chen who was running like crazy. The Ice Demon King’s intellect was much higher than that of the other Ice Demons. It forcefully stretched out one of its gigantic palms, grabbing toward Jiang Chen like a gigantic curtain that covered the entire sky above Jiang Chen. Jiang Chen wouldn’t just sit back and wait to be killed when facing such a powerful attack. He shouted out loudly and countered with the True Dragon Palm. The gigantic blood-red dragon claw was fully covered in True Dragon Flames as it threw itself at the Ice Demon King’s gigantic palm. The True Dragon Flame was of the purest Yang energy, and was indeed the nemesis of all cold existences. The Ice Demon King was naturally suppressed by it, slightly. Because of that, it simply couldn’t unleash its full power. However, the gap between both sides was too huge. It was so huge that nothing could really shorten it. Even with the help of the True Dragon Flames, the True Dragon Palm was still destroyed in an instant. Right after the True Dragon Palm was destroyed, a tremendous force hit Jiang Chen’s body, knocking him 500 meters away from where he stood like a shooting star. Under such a brutal impact, even with Jiang Chen’s powerful body, he was still immediately injured. A mouthful of blood was forced out from his mouth, and he could feel his qi and blood violently trembling, causing him to feel pain difficult to bear. Luckily, it was Jiang Chen who had to face this. If it was someone else, that person would definitely have exploded into a b.l.o.o.d.y mist on the spot. Ever since Jiang Chen started cultivating the Dragon Transformation skill, his body had become stronger and stronger, and this was the main reason why he could withstand the Ice Demon King’s powerful blow. Jiang Chen’s expression was a sore sight. He now knew how terrifying the Ice Demon King’s attack was. He that although he could withstand this strike, he might not be able to withstand the second attack. An idea suddenly emerged into Jiang Chen’s mind. He immediately retrieved the Demon Taming Lock from his storage ring. He had obtained this item back in Inferno h.e.l.l from Yang Shuo. He could still remember what Big Yellow had told him, the aura of this Demon Taming Lock made Big Yellow feel really bad. Even the descendant of the Dragon Horse, a true Divine Beast was affected by it. Although the Ice Demon in front of him was an unusual creature, as long as it had a Demon Soul in its body, it was still considered a demon. This Demon Taming Lock could even affect Big Yellow, let alone this Ice Demon. The True Dragon Flames and Demon Taming Lock were all the weapons Jiang Chen could use against this Ice Demon King. Only by suppressing the Ice Demon King’s strength would he be able to run away from it. When the Demon Taming Lock appeared, it instantly produced a crystal clear ringing sound. The sound turned into waves which then rolled toward the Ice Demon King. Hearing the sound of the Demon Taming Lock, the Ice Demon King immediately became cranky and lost its previous tranquility. It hated the Demon Taming Lock! On the other side, Jiang Chen could clearly feel the Ice Demon King’s fear. Jiang Chen laughed. While controlling the Demon Taming Lock, he covered his body with True Dragon Flames and continued running like crazy. Of course, Jiang Chen didn’t try controlling the Ice Demon King with the Demon Taming Lock, because he knew this wasn’t possible at all. 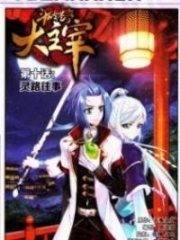 The Demon Taming Lock wasn’t an advanced item, so it was very difficult to control a Late Combat Soul Demon unless Jiang Chen had a stronger cultivation than the demon. Although the Demon Taming Lock couldn’t help Jiang Chen control the Ice Demon King, it could still help him restrain its strength so that it couldn’t fight and chase with all its strength. The Ice Demon King was furious, and it unceasingly bombarded Jiang Chen with attacks. As for Jiang Chen, he was running for his life while unleashing all kinds of powerful counter-attacks. The Firethorn Combat Armor was fully protecting his body, and the golden spear was countering the Ice Demon King’s attack. Jiang Chen didn’t stop running for his life. Each of the Ice Demon King’s attacks would make him throw up a mouthful of blood. If not for the True Dragon Flames and the Demon Taming Lock, Jiang Chen would have been killed long ago. Jiang Chen kept cursing inwardly. The Ice Demon King had yet to show any signs of giving up; it was completely determined to kill Jiang Chen. The worst thing about this was that this was an isolated world of endless glaciers, and there didn’t seem to be any way out either. Jiang Chen was completely trapped! Suddenly, Jiang Chen saw a bright reflection not far in front of him. Jiang Chen was very familiar with that kind of reflection, it wasn’t the reflection of glaciers; it was reflection of water! Jiang Chen was surprised, but he had no doubts about his own judgment. Without hesitating, he immediately started flying toward the pond. After flying another 5 kilometers, Jiang Chen could really see a deep pond underneath him. The water was flowing freely, and wasn’t frozen. The reflections he saw really came from here. Jiang Chen turned around and looked at the Ice Demon King. To his surprise, he saw it standing a bit more than 30 meters away from him the pond, and it was pounding its own chest and stamping its own feet while continuously roaring out. It didn’t dare get closer to the pond! Even Jiang Chen was shocked by this. But finally, he could let out a sigh of relief. Regardless, with the help of this pond, he could finally escape from the Ice Demon King’s pursuit. After speaking those words, Jiang Chen descended toward the pond. One would usually be brave if he had incredible skills, and Jiang Chen had pretty much experienced everything in his lives. Therefore, he wouldn’t be stopped by a deep pond. Jiang Chen jumped straight into the deep pond, causing the water to splash. When the Ice Demon King saw Jiang Chen really jump into the pond, it immediately became crankier. It started roaring, then it took a few steps forward, but instantly stopped going further. The Ice Demon King was irritated. It walked back and forth, but it didn’t dare take another step closer to the pond. After diving into the pond, with his speed, he instantly descended 30 meters into the pond. However, he still couldn’t see the bottom of the pond. Jiang Chen circulated the Great Soul Derivation skill and spread his soul energy around, carefully examining every single part of this water pond. Soon after, Jiang Chen descended another 15-18 meters, then the water flow immediately became violent. There were also some bright lights blinking in front of him, filling him with astonishment. Without hesitating, Jiang Chen started moving towards those bright lights. You're Read Dragon-Marked War God Chapter 327 online at NovelOnlineFull.com. You can use the follow function to bookmark your favorite novel ( Only for registered users ). If you find any errors ( can't read,broken links, can't load photos, etc.. ), Please let us know so we can fix it as soon as possible. And when you start a conversation or debate about a certain topic with other people, please do not offend them just because you don't like their opinions. You're reading Dragon-Marked War God. This manga has been translated by Updating. Author(s): Su Yue Xi. Already has 6752 views. Current Time is 19-Apr-2019 17:00:29 PM.